Hamish Marshall’s classy knock of 90 helped Gloucestershire to a 11-run win over Sussex in their Natwest T20 encounter at Arundel this afternoon. The experienced New Zealander struck 90 from just 55-balls to help his side post an imposing total of 184-4 from their 20 overs. That score always looked to be a tough ask for Sussex to chase down, though, a knock of 71 from Luke Wright gave them some hope before he fell to all but end his side’s hopes as they ended their innings on 173-9. Despite suffering an early setback with Michael Klinger falling for two after being trapped in front by Ajmal Shahzad, Marshall and Cockbain shared a fine second-wicket stand to get their side back on track. Marshall and Cockbain put on 120 for wicket number two with those runs coming from just 75 balls, laying a perfect platform for Gloucestershire to kick on and make a big total. When Cockbain fell, having made 37 from 33 balls including two sixes, Marshall then stuck around sharing a third-wicket stand of 28 with Chris Dent who ended unbeaten on 15. The classy New Zealander would have been disappointed with his dismissal after picking out Matt Machan at point off a wide Shahzad delivery which saw him fall ten short of his century following a 55-ball knock. 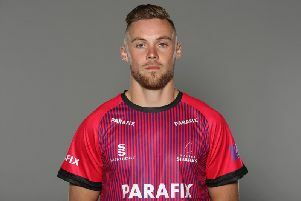 Benny Howell then came in and crashed 23 from just ten balls, including three sixes, as Gloucestershire posted 184 for four from their 20 overs. Shahzad was the only Sussex bowler to stand-out and his figures of 3-26 were his best ever in the Natwest T20 Blast. Chris Nash (13) went early in Sussex’s reply after he was caught at fine leg by Matt Taylor trying to sweep Graeme Van Buuren to leave them 27-1. That brought Phil Salt to the crease but he went soon after attempting to reverse sweep Tommy Smith but was trapped in front for 12. With the vastly experienced pair of Wright and Taylor just beginning to get things going, disaster struck with the New Zealander caught fell for 16 as Smith trapped him in front. Wright really began to ramp things up soon after Taylor fell and he was looking well set before he picked out Andrew Tye for an easy catch on the mid-wicket boundary. His knock included eight fours and two sixes but Sussex needed their skipper to stay until the end to have any chance. After the skipper went, Matt Machan (31), Ben Brown (five), Will Beer (two), Shahzad (nought) and Danny Briggs (11) all went as Sussex stumbled to 173-9 in the end. Taylor ended with impressive figures of 3-29, while Smith and Van Buuren both picked up two wickets each.